This is a subject that every Arsenal fan has talked about at some point: did the club have to rein in spending in order to build a new stadium? Has Arsene Wenger worked miracles year after year on nothing more than the budget of a Conference team? Everyone has an opinion, but no one has actually done the maths. Some information is rather confusing. This for example: I’m really not sure what that last sentence even means, and the rest of it seems to bear little resemblance to what the accounts show. So you have to ignore ill-informed web articles like this. Anyway, look at the the links in blue: “Gervinho a breath of fresh air” – I don’t think so. You can’t trust the BBC. Before I go further, there’s a point I want to emphasise: this blog post is not about whether Arsène Wenger has done a good job with the money he’s had to spend, it’s solely about how much money he’s had to spend, and whether that was increased or decreased by moving stadiums. I don’t care if you love or hate Arsène, if you want to argue any of the points made I strongly suggest you read the whole thing twice before you post a comment. Next let me just say I’m not an accountant, I just take what accountants and sets of accounts tell me and try and translate it into normal English. Accounting has a relationship with the real world, but sometimes only tangentially. What I’m trying to show here is the real world effect on Arsenal’s available funds to spend. Even highly trained accountants don’t always agree with each other after studying Arsenal’s accounts, as much of the real detail we’re interested in as fans is hidden. So some things are open to interpretation. And in my experience accountancy and plain English tend to get on like Nicklas Bendtner and modesty, so it can be even harder for normal people to get to the truth. But I’ve had a go. I’ve had some expert help from Simon Hill of the AST, who is not only a very good accountant but has also had many meetings with Arsenal’s finance team and knows a lot more than can be gleaned from the accounts alone. Again, consider this before proposing an alternative view. 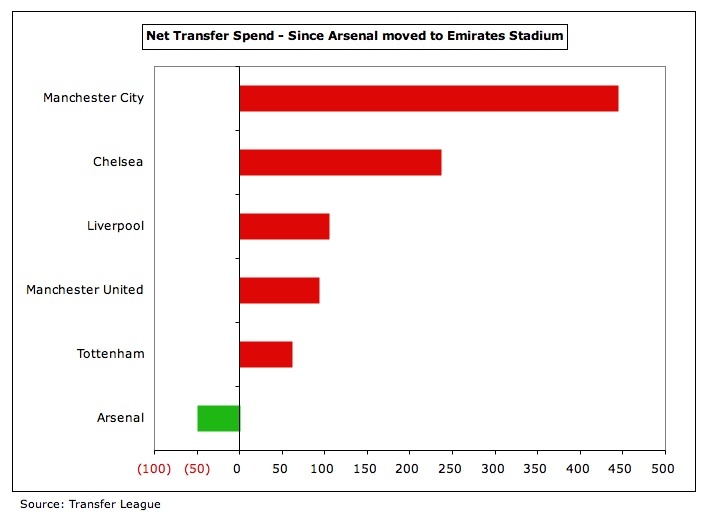 Was Arsenal’s (= Arsène Wenger’s) spending restricted by the stadium move? Figures are not always exact and in some cases never will be, but they are relatively close. Where possible they are entirely factual, but inevitably assumptions also have to be made. For ease, everything is rounded to the nearest million. Any increase in TV money and marketing (ie non-sponsorship commercial deals) as a direct result of the move is ignored as being unprovable. The table starts in 2007, because before that Arsenal took on a debt to build the stadium (a ‘project finance loan’) and kept it away from the rest of the business as capitalised expense (one for the accountants there). Then in 2006, once the stadium was finished they refinanced and are now paying the debt off until 2031 (the refinancing was in July 2006, so shows up in the accounts to May 31, 2007 – each year in the table means ‘Financial year ending May 31 20xx’). Before 2006 part of Arsenal was effectively acting as an independent property developer separate from the football club (sort of – you can argue the stadium move had some influence on spending for a couple of years prior to 2006; see concluding notes), and since then they have to take money away from the football business to finance the debt put in place by the property development. However, even after 2007 there was money flowing in and out on property deals until the debts to finance the Highbury development were cleared by sales of properties there, so it’s not that easy to see at first glance. And there is also still some money trickling in from property sales, though unfortunately nowhere near the amounts originally expected. Either way, don’t let Gary Neville tell you all the debt is paid off, because it isn’t. The debt position, especially in terms of annual cost to service it, is pretty much the same as it’s been for the last six years, and it won’t change much in the forthcoming years either. The difference will be that it should become a smaller and smaller proportion of turnover, so in that sense it becomes more manageable. Alongside that, the restrictive sponsorship deals are now ending. Arsenal are also getting the benefit of the massively improved TV deals now coming in, and although all clubs are benefitting, the biggest are benefitting a little more as they get more TV appearances. Lucky break for Ivan, there. You could argue that if Arsenal hadn’t taken on a big debt to build the stadium, then they could have taken on some debt to strengthen the team, leading to greater glory and silverware. However, that has never been the Arsenal way, so it’s unlikely it would have happened. More likely that without a move the finances would have developed only slowly – evolution rather than revolution. So some explanation on the table. The factual information here is from Arsenal’s published accounts. But although a lot of information is public, some of the detail isn’t, so there’s an element of reading between the lines. For instance there is a miscellaneous costs amount in the accounts of anything up to £50m, that covers everything the club would rather we didn’t know in detail as it’s not legally obliged to say. This includes all the team travel and expenses, the seven-star luxury of 14-minute flights to Norwich and that sort of thing, and even the share of money to the other teams in the Emirates Cup. Receipts from concerts and other non-football events are included in the accounts as deductions to the miscellaneous costs figure. As an aside, profit per concert is reckoned to be around £0.5m. Figures for 2014 and 2015 are obviously projected, but will be pretty accurate. There are other things in the accounts that can’t be predicted precisely, but nearly all this information can. I’ll go through and explain line by line. Gate receipts: these went up from around £40m at Highbury to £90-£100m since. In 2006 it was actually £44m, but that was exceptional as it included a run all the way to the final of the Champions League. It’s been comfortably over £90m most years since, so allowing an extra £50m a year is more than reasonable, even assuming some level of price increases had we not moved. However, some Executive Boxes and Club Level seats were sold on four-year deals in advance, and that money went into the stadium build. So for 2007-10 inclusive I’ve deducted £6m a season from the additional £50m to allow for this. Running costs: these are simply the costs of running a much bigger stadium, and indeed a much bigger organisation all round. Not an exact figure, but can be estimated from the differences in accounts between 2006 and before (old stadium) and since 2007 (new stadium). The 2007 accounts actually quote increased running costs of £7m, so I have taken that figure and allowed for some inflation since. Interest and Debt repayments: These are listed in the accounts, so are accurate figures (allowing for rounding). The club’s current debt is nearly all connected with the stadium move (the remainder is bonds). Property: Prior to 2011 there was no property profit declared, because it went against the debt incurred as the cost of development at Highbury and the other local sites. In this sense there was ‘ringfencing’ of the property dealings, though the current outstanding debt is not ringfenced and must be serviced from football income. In 2011 a £25m profit was declared. In 2013 there was money from Queensland Road and other small sites, but this was offset against debtors in the accounts so will only really be available in 2014. After that there will be approximately a further ten million in 2015, but not much (if any) more. As a further property note, there was massive turnover declared for the club in 2009 and 2010 because of property dealings, but it was not all profit and didn’t bump up the available cash much, if at all. Catering: Arsenal struck a deal with Delaware North for them to handle the catering at the new stadium, and for an upfront payment and agreed fee Delaware get to keep all the profits. You could argue that this has not worked out particularly well for Arsenal for a number of reasons, not least the lack of control Arsenal have over what goes on regarding catering. This led to the rather amusing sight and sound of Ivan Gazidis at the May 2013 supporters’ Q&A session telling fans that he used to go to the pub before matches rather than spend in the stadium, hint hint! It’s difficult to decipher all the details of the Delaware deal from the accounts, but some money was definitely received up front and ploughed into the stadium build/refinancing. I believe Arsenal get a percentage of the take, but we’re not talking about huge numbers anyway. You also have to offset that we’ve lost the catering profit from Highbury, though given the smaller crowds there that wasn’t major income either. Summary: some Delaware money went into the stadium build, but as catering is now much bigger than before and there is a bit of income from it, I don’t think the overall position is much different to having stayed at Highbury. So I’m estimating a ‘cost’ (ie a ‘loss of cash’) of £1m a season, and if anything that’s probably rounded up. Sponsorship: This is also difficult. We know roughly what we got and usually on what terms we got it, but we don’t know what we would have got had we stayed at Highbury. So we need to consider what would probably have happened in the alternate history of remaining at Highbury, compared to actual history. Where sponsorship (or any other) money was received up front and ploughed into building the stadium, it effectively disappears from the figures. Obviously it doesn’t really disappear as it prevents an even larger debt being raised, but it means it’s not available to be spent season by season as it normally would, so there is a ‘loss of cash’ there. Emirates – Stadium name and shirt sponsorship: This is the most difficult bit to work out, because statements made as headline-grabbers by the club don’t always seem to match what then shows up in the accounts, about how much is being paid and when. Not only that, but sports reporters jump on announcements and misinterpret them, and the way of digital media these days is that everything gets copied by everyone, and before you know it a load of made up assumptions are treated as fact by Gary Neville. 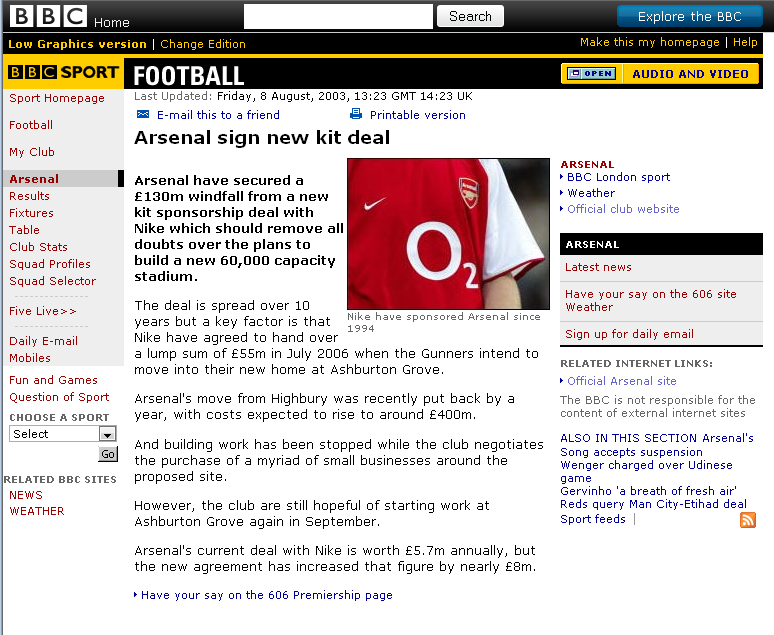 The original Emirates deal was worth around £100m, made up of an eight-year shirt deal at approximately £8m a year, and 15 years of stadium naming rights at just under £3m a year (£42m in total is quoted in the 2007 accounts). The deal was signed at the end of 2004, but the name didn’t appear on the shirts until we’d moved in 2006, as the O2 deal continued. I believe Emirates paid a couple of years up front, which was sunk into the stadium cost, and the rest of the money was spread annually from 2006. Previously we’d been getting £6m a year from O2, so the first few years of the Emirates shirt deal at £8m a year weren’t too bad at all. Where we lost out is a) we would normally have renewed the deal after four years, or found another sponsor to increase it, so there is a lost opportunity there, and b) some of the money was up front, so got swallowed by the build and refinancing. In 2012 Arsenal announced the renewed deal with Emirates to start in 2014 (so it won’t show till 2015 figures). There was supposedly an upfront element to this in summer 2013 (which would show in 2014). However, nothing certain was stated so for 2013 so not I’m assuming any new cash in. But there was about 18 months left on the old deal when the new one was signed. This bit is unclear, but I think the old shirt deal was paid up in full rather than some of it being absorbed in the new deal. So there’s extra money in 2013, 18-months-worth instead of 12. From 2014 I’m saying we’re back to par on the new deal – we’re at market rate, so no different (certainly no worse) than if the move hadn’t happened. Current understanding is that the new deal pays £25m annually to 2019. 2007-2009 – a ‘loss’ of about £2m a year, because there was some up-front cash, so all remaining payments are calculated at about £6m a year instead of £8m. 2010-2013 – if we’d renewed or gone elsewhere in 2009 on a four year deal, it would potentially have been £15m a year (the going rate at the time), so there’s £9m a year from 2010 to 2012 of lost opportunity by moving, but only about £5m ‘lost’ in 2013 as the last payment on the old deal was accelerated. 2014 – new deal starts, so back to par – no gain or loss as we are getting market rate. I fully admit there is some educated guessing going on here, on both the Highbury and new stadium sides. I could be a few million out, but not enough to drastically change the overall picture. The stadium naming is also not crystal clear. As I said above, it was quoted as £42m for 15 years. This money has, I believe, been paid annually, so rounded up that’s £3m a year. But when the new deal was done in 2012 Ivan played down the importance of the stadium naming rights, saying in effect it wasn’t really worth anything because everyone was used to it so they couldn’t sell it elsewhere! This is disingenuous to say the least, or if we’re not being so kind it’s an outright lie. I’ve written about it before so I won’t go into it all again, but the fact is the stadium name should be worth something, but it’s all part of the new shirt deal. The shirt deal doesn’t look quite so good if you knock off £3m a year for the stadium name value, does it Ivan? 2007-2012 – £3m a year benefit. After 2012 – no benefit. The remaining £28m is wrapped into the Emirates shirt sponsorship deal and effectively given away. Nike kit sponsorship deal: This was for £55m over seven years (£8m a year rounded) from 2004-2011, then extended by Nike to 2014. In this case I believe all the original money was paid up front and sunk into the stadium cost. Certainly it was paid by 2006. However, there was a small element of royalties paid on sales, so there was approximately an extra £1m a year in. When Nike chose to extend the sum went up to about £11m a year including the royalty (2012-14). Kit sponsorship deals usually last four years, so if we’d gone down that conventional route we could have renegotiated at market rate in 2008, and again in 2012. So there is some ‘lost money’ over this period, and in fact all the way to the start of the new (Puma) deal in 2014. 2007 and 2008 – ‘loss’ of £8m cash as money already received and spent. I’m ignoring the royalty money on the basis we’d have got it year by year whether there was an upfront stadium deal or not. 2009 and 2010 – assume renewal/renegotiation for four years at £12m a year should have been possible, so a ‘loss’ of £12m cash a year. 2011 and 2012 – we’d still be in the £12m a year four year deal, but in fact Nike renewed their deal for three more years and paid £11m a year of new money. This gives a ‘net cash loss’ of £1m a year. 2013 – without a stadium move this would be time to renew/renegotiate again, with a market rate of say £20m a year. So a ‘loss’ of £20m but £11m of actual Nike cash coming in, meaning a ‘net cash loss’ of £9m. 2014 – in the real world a £30m a year deal with Puma, so offset that against the theoretical £20m missed out gives a ‘net cash gain’ of £10m from moving. You may say that as we’re getting £30m a year from 2014, why am I only allowing a ‘market rate’ of £20m for the theoretical 2013 deal? Well it’s one year before, and negotiations would have taken place one year before which makes a difference, and a club in a 60,000 seater stadium is a better prospect than one in a 38,000 seater stadium, all other things being equal. I would argue that the size of the new TV deals has influenced other sponsorship agreements as well, as the PL looks bigger and brighter than ever on a worldwide scale. So there you have it. As a result of moving stadiums, the ‘profit’ to date comes out to around £63m, but as we’ve reached the end of the restrictive sponsorship deals it jumps considerably in 2014 and will do similar year on year after that, minus the tailing off property profits. That this coincides with massive new TV deals is a bonus for Arsenal. I’ve started the table in 2007 (after the refinancing, when ringfencing effectively stopped), but I believe the Nike deal cash for 2004-06 couldn’t be spent on the team, as that went straight into the stadium finance. So that’s £24m of cash ‘lost’ before the move, which has some significance, though spread over three years it’s not huge – it averages 5.5 per cent of turnover in the period. I haven’t included any extra merchandising revenue, though it’s likely that has had a benefit of at least a couple of million a year due to the increased stadium traffic and much bigger retail outlets. Over the whole period this is close to balancing the ‘lost’ Nike money’, though admittedly not at the same time. Some of the calculations are educated guesses, and no doubt won’t please everybody. But I’ve been putting different figures into this table based on different assumptions for some time, and the pattern is always the same: small cash benefit from moving in the early years, rapidly growing cash benefit more recently, and promised land now within sight. Some people claim that Arsenal had to curtail spending on players even before the stadium was complete, which is why the likes of Vieira and Henry were sold and not replaced, and why Arsène seemed to have his rigid ‘no over 30s’ policy. I think that’s a flimsy argument. In the case of PV4 and TH14 it ignores their desire to leave for new challenges before it was too late, and the annual ‘will they, won’t they’ sagas we endured as other clubs courted them. It also ignores every bit of evidence about Arsène preferring to develop players rather than purchase the finished article, and his belief that physical prowess begins to dip sharply in a player’s fourth decade. So while there was certainly a policy of caution from the time the stadium arrangements started in earnest, it didn’t hamper the team spending unduly, and overall spending continued to grow. There was only one year where there was a temporary downward blip in overall wages. So in reality there was not huge belt-tightening pre-2007. Arsenal was always run prudently and spent what was earned, so with the property development side separate until the refinancing in 2006 things carried on much as before, with just the ‘loss’ of the Nike money to contend with. I accept that it’s possible attitudes towards buying and selling players changed because of the stadium project in the background, but the figures show that at least as much money was available – as you can see there has been more cash available every year bar 2010, where I show a negative effect for the only time. The follow-on question is this: why have Arsenal allowed their cash balances to increase during this period instead of spending everything available? That I can’t answer, but I’m sure people have plenty of theories. Of course what we don’t know is what would have happened to cash balances if Arsenal had stayed at Highbury. They may have increased in the same way. And it’s important to point out that it would have been impossible to build up a cash balance of even tens of millions of pounds before a decade ago, as there was far less money in football. By comparison, when Arsène arrived the total Arsenal wage bill was £15m per annum and turnover was just £27m. In 1990 Arsenal’s total turnover was about £7.5m – 15 years later Arsène and Thierry Henry almost got paid that much each for the year. Football finances are in a different world now. Against this changing backdrop Arsène Wenger may be a genius for keeping Arsenal in the Champions League year after year and maintaining a level of competitiveness against better funded clubs. But I can tell you he hasn’t done it on less money than he’d have had if we’d stayed at Highbury. The construction of Emirates Stadium resulted in the Group incurring an initial debt of £260 million through a project finance loan. However, following the refinancing exercise completed in July 2006, the £260 million loan was replaced by a credit wrapped bond which has a fixed interest rate. The interest rates achieved in the refinancing were excellent, 5.14% on £210 million of bonds with a 23 year term and 5.97% on £50 million of bonds with a 25 year term, and reduced our annual debt service cost from some £32 million to £20 million per annum. During last year we began repayment of the bonds so that the outstanding balance as at May 2007 was £255 million. The result of the refinancing is that Emirates Stadium produced an increase in revenue in this financial year of some £55 million against the funding cost of £18 million; an overall surplus of £37 million before additional operating costs of some £7 million. Significant funds were available to the manager during the summer transfer window as evidenced by the cash balance at the end of May of £73.9m. Although transfer activity [in summer 2009] was limited I can assure fans this reflected [Wenger’s wishes] rather than any necessity or financial constraint. I know some people will still want to believe the Board were/are lying and Arsène is covering for them. As you wish. ← Arsene Wenger: Eight Years of Failure or Eight Years of Genius? Phil, I didn’t have to read nearly as carefully as you suggested in order to see a basic fallacy of your logic. Arsenal didn’t have any less money to spend after the move from Highbury, and I believe your accountant friend on that. But they didn’t have any MORE either, as your own numbers show, and suddenly they had a massive multi-billion debt hanging over their head. Don’t you think the club might have been much, MUCH more reticent to spend in that setting than had they not had such debt? Especially since, as you point out, any spending meaningful enough to seriously rival our domestic competitors would surely have plunged us into further debt? Let me also remind you of the fragile to disastrous economic climate that has existed in Europe, that has somehow left football untouched… but how could they have foreseen that in 2004? They had to plan for every eventuality. Yes, the club’s executives have played it safe. Whether they played it too safe is a judgement call, and lots of people will feel different about it. But the numbers you present here don’t make a significant statement or give us much we didn’t already know from Swiss Ramble and others. 1. Yes, after 2011! Before that, the NCE is -7 to +6, hardly swimming in riches. 2. I don’t think 400 million is that small, do you? 3. And your table starts in 2007, so there’s a bit of an overlap, no? 4. I’m glad you discussed with SR. My feeling from reading his posts before left me with the same impression that you convey here; AFC has always had money to spend if it wanted to. The difference, that you conveniently neglect to address (and my main point) is that after 2005 they suddenly had to think about the massive (yes, a stadium can carry that word) debt. This I think is misleading as, first of all his two major articles from Aug 2013 and Oct 2012 both have the pieces that provide most of the implic answer to this question as to whether Arsenal had money available. He showed that they did, but he also showed that the amount they had available was but an insignificant one in comparison to the amounts of money that the big spenders were actually pouring out. And extra hundred million of cash over 7-8 years was nothing. As such he had answered the question. – why Arsenal would suddenly develop an appetite for that sort of risk on the transfer fees front, when already in the face of massive debt. You havent addressed these questions either. Perhaps because the answer is fairly obvious and does not suit the desired narrative. Moreover, the question that all the Usmanov fans should answer is why, if this guy loves Arsenal so much, was he not willing to offer Arsenal say a friendly loan of a couple of hundred million, to buy players. Usmanov is business partner with David Dein, so all this this hefty analysis he wouldnt need, as Dein could tell it all to him: Arsenal needed a lot more cash than they actually had available if they were to make an impact in the market. So Usmanov knew the situation – Arsenal had some money but really not enough to make a difference. Meanwhile what was he doing? The level of charlatanry we see from this fellow is really beyond belief…. The thing with Usmanov is, there’s this thinking that he’s going to splash the cash like Abramovich, yet, he has never actually said so, despite having several opportunities. When asked whether he’d spend to get Messi, he said well everyone wants Messi, but in the future we expect transfer prices to go down (a reference to FFP perhaps?) He has also not demonstrated his desire to fund Arsenal, as you point out. In fact, he criticised Gazidis for approaching a company that Usmanov is a board member of, for sponsorship. (Who knows if that happened) Every time times are bleak at Arsenal, up pops a voice from him to say how bad the board are doing, and how much better the ‘fans’ at R&W would be. I don’t understand why people believe this. He is not an Abramovich. He’s made his money investing in businesses and then selling their shares at a higher value-something Arsenal are prime candidates for, while Kroenke actually is in the business of sports. Yet, Usmanov is seen as a saviour by many. I always felt the arrival of oil money had more to do with our prudency than the stadium move. When we were scheming to move to the new stadium, I don’t think the club ever thought wages & fees would explode post the arrival of Abromvich. ManU adapted brilliantly by increasing the commercial revenues. We, on the other hand, were stuck with long term kit & shirt sponsors. As for Arsene, I would say the consistency of top 4 finish every season is a tremendous achievement. However, I also feel if he hadn’t gotten too muddled in youth development & added a couple of experienced players to the 07-08 team, we would definitely have won some silverware. We definitely had the funds to get them in. And mind, you that’s just taking about the money those coompetitors DID, spend – had Arsenal bid higher for players those guys would have spent even more, as they had the cash and it was in no way linked to their revenues. Would have been urinating in the wind…. Kripakar: Yes, they had the money to get more players in. But would more players have prevented what happened to Eduardo, or stopped Gallas from bawling? Would it have prevented the epic collapse that year? I don’t think so. That team was good enough to finish and that they didn’t wasn’t because they didn’t have the talent or the depth, it was because they lost their confidence and their togetherness after Birmingham. That’s a lot of detail to get through, and I intend to do so when I have the time. First impressions though. I don’t think the argument that we would be better off if we’d stayed at Highbury ever really had any basis. There is no doubt the stadium generates more funds for us. So as far as that goes, I agree that it wasn’t less money than we’d have had at Highbury. Probably a bit more, even with the loan repayments and long term deals. Although, for a period of time, I believe this was lower. Which is something your article might have suggested too, with the money from the early deals going towards building the stadium. I disagree with the contention that the stadium had nothing to do with the sales of Vieira and Henry. Well, in the sense that though we might have sold them anyway, we certainly wouldn’t have replaced them with the likes of young Fabregas and Van Persie if it weren’t for the stadium. When we sold players before that, we got in experienced players. Overmars, Petit, Anelka sold. Pires, Gilberto, Suker and Henry bought. This love of developing players that Wenger has also never really overwhelmed the first team prior to the stadium move being imminent. Indeed the likes of Bentley and Pennant forced moves away. Brady complained about youngsters not being given a chance, and even Ashley Cole was going to be sold before Silvinho’s passport issues. So, I most definitely think that ‘project youth’ was borne out of necessity as much as philosophy. We might have had the same amount of money at the time, but to replace like for like is actually more costly, especially because you have to repeat the process 3 or 4 years down the line at the latest, instead of, as planned under the ‘project youth’ to have a team play together for a decade. The rise of the oiler clubs happened just when we had our period of low spending. From 2009 to 2012, ManCity and Chelsea outspent us by something like 120 and 110 million (approx) per season (wages and transfers) Did we have the money to compete with that? Not at all. Our relative financial strength was low, even compared to clubs like Liverpool who could renegotiate their sponsorship deals to gain an advantage over us for a few years. What we did have was champions League. Apparently we budgeted to fall out of that once every 4 years or something, which might explain some of the cash. Anyway. We’ve probably had some decent cash to spend for 2 or 3 years. We’ve apparently tried to sign Reina, Hazard and Gotze in that period, willing to spend 20 and 30m+ on them. Now that might be just fluff, but I believe we were looking to spend that money. But on players who could push us a level up, instead of just buying anyone. However, this was the year that things were to change. The sponsorship deals are now signed, giving us an idea of our future budgets, our cash reserves have meant we aren’t desperate for cash (which ironically means sponsors are willing to give us more cash), and we’ve managed to build infrastructure (medical centre, training facilities) and signed the core of the squad to long term deals. We had nothing else to spend the money on, and knew we had money coming in. Also weirdly, I suspect we might have actually reduced our wage bill despite signing Ozil. A semi clearout of ‘deadwood’ at both first and reserve team levels. That this realignment happens when we have extra funds, is not a coincidence to me. Since extra funds allow you some flexibility to change things around and not worry about having to get everything correct. There’s a safety net. So I don’t think (and never thought) the board were lying about there being money. I think however that the money was less than what was needed. I also think that we could not have paid 150-200k wages to the likes of RVP and Nasri to keep them and that it was the instability in the squad that harmed us more than simply lack of funds to buy more players. I’ll look to add figures to my argument at some point (busy these days) and possibly modify it if the figures stack up differently. But that’s my basic view on our stadium move. PS. The rising cash reserves has been the major issue of contention, and it could be potentially malafide. However, there is still an alternative explanation for it. We’ll see how that goes over the next 3-5 years. I for one, am confident that we can now compete for most of the best/most expensive players in the world, if we so choose. That’s not the same as saying we should, but some investment in the squad must continue. Or I could have not rambled and just agreed with Dr.Gooner.. Yes there has been money to spend . But what was the ‘clubs’ targets? 1) Maintain top four and win a few cups. 2) Go all out and challenge for the prem. 3) Be challengers on all fronts. We have not shown the ambition needed for 2 or 3 and the board are more then happy to offer Wenger a new contract. Either Wenger has been somewhat successful In fulfilling his contractual obligations (top four) or the board are so powerless, that failure Is not a problem. 1) Was Özil a purchase of fan pressure and (lucky) timing or will we see other world class players being brought in? 2) Will Wenger ever start a game with the tactical sense to play the team In front of us and use a formation suitable to the players available? I would recommend to you to go read a book. Several books, in fact! Says the guy who couldn’t even make it through this blog post but still felt the need to complain about a “basic fallacy” while claiming things like that they had a “multi-billion debt hanging over their head”. According to at least one pundit – expert this happened against Hull. I am not an accountant and although not bad at maths most of the financial side of this goes over my head so I am not going to pretend I know if all these figures are correct or not. The way I see it is it’s not have Arsenal not had the cash to spend but, have Arsenal Football Club been running the club to a long term plan. A plan that in the beginning back in the late 1990’s and early 2000’s was based on how things were within the PL from its creation to that point. A point where Arsenal looked and thought roughly they could afford to spend twenty million pounds per year on players to maintain their position in the top two of the PL. Once Arsenal Football Club committed funds to the new stadium there was no going back for them, early in 2003 a huge obstacle to this plan entered the PL world in the form of Roman Abramovich this threw a huge spanner into the £20m per year transfer fund.. Arsenal with their planned £20m transfer budget were blown out of the water with an average yearly spend from the time Abramovich took over to the time Arsenal moved of One Hundred Million pounds. Many advocated at the time to spend, spend, spend but to me that would of been foolhardy and this is where hindsight comes in to whichever way you look at this. Not one of us can say for certain if spending more money in the January of 2008 would of kept Arsenal within touching distance of winning the league etc. I think Arsenal Football Club with Wenger have had a long term plan for the club and one that Stan Kronke brought into when he was looking at Arsenal. He saw a club with financial stability, a club looking to the future not just for the here and now. Yes Arsenal has gone through some hard times and a lot self inflicted but this period can only looked back upon in years to come to whether it was the correct path to take. There is I think to much emphasis on short terminisum in life today it is all about this year or next very few want to look at ten or fifteen year down the line and this is where I believe Arsenal, its board and Wenger deserve credit. They did not panic, under huge pressure from the media and fans they stuck to their guns and I think we can see the Arsenal of the future starting to come out of the self imposed financial situation it put itself into. I suppose the question is would spending all the money it looks like they had from your figures, have made any difference to the team/squad at the time and affected how the club is run/financed in the future? Allow me to call it”” Arsenal Accounting for Idiot fans.””And i am one of many out there. ,I appreciate your effort too. My take is that the board and the manager they where absolutely strict to reduce the level of the debt, and youth project was the only way to go.Given the circumstances youth project was a necessity.and what ever negative it was deemed acceptable. To decide on that day and to judge it today for the past are different things. The paradox of why AW chose not to spend on much-needed quality signings when there was money available is easily solved if he had committed to zero nett transfer expenditure as part of Danny’s austerity programme. And if, to enable him to achieve that, Arsene demanded final say on transfers. Also final say on wages because Danny lumped both transfers and wages expenditure into one budget. Thus the more Arsene spent on wages, the less he could spend on signings. Indeed the anomalies and mysteries which puzzle us – from youth policy to denying contracts to ‘diminishing assets’ like Pires and Gilberto – start to make financial sense. Also it would explain the ‘firing’ of Dein if he preferred the other option of a Rights Issue to finance signings – even though it might dilute the value of his share-holding. Last summer the Great Gatz told us austerity is over – and it’s pretty clear from subsequent statements and events that he wants ‘final say’ on the ‘how much’ of transfers to revert back to the CEO (and BoD) as in the days of DD. But Arsene, it appears, rather likes the way things are.